Look at this hat! It has black bats, black cats, and creepy crescent moons. Soooo spoooooky! The Spooky Nights stranded knitting hat is the perfect topper for the Halloween time of year. Wear it on trick-or-treat or just around town because you love creepy stuff. Use Ewe Ewe Wooly Worsted yarn to make this hair-raising hat. Our new Citrus Pop works perfectly to add the right amount of eeriness. 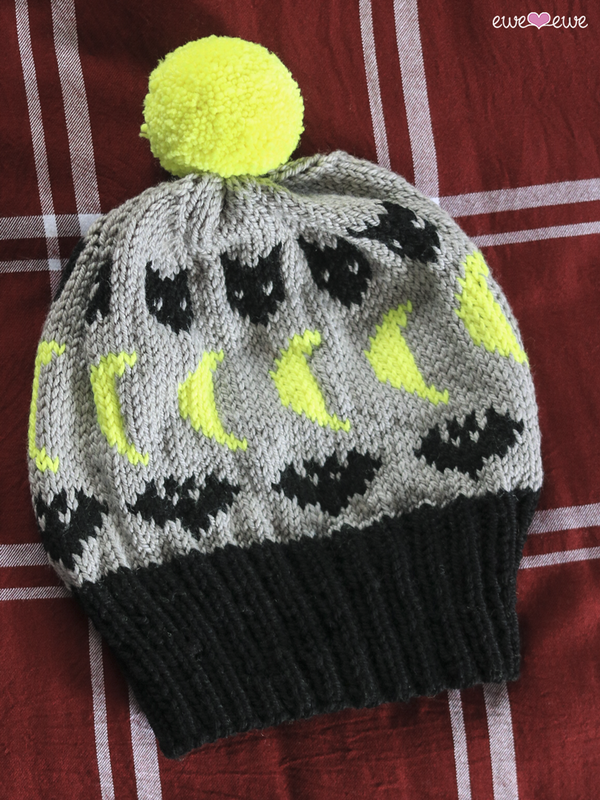 Bundle and save: The Spooky Nights hat is also part of our Halloween Hats eBook that includes 4 more season hat knitting patterns. It’s a great deal for 5 patterns! Get the pattern and the yarn! This is going to be fun! Look what’s happening at Apricot Yarn & Supply! For Halloween we are partnering with Apricot Yarn & Supply in San Diego for a Halloween Hat Knit Along. With 5 hats to choose from! There will be 5 Halloween-themed hats - designed by Ewe Ewe Yarns - to choose from. Ewe Ewe Yarns will release the NEW patterns on Sunday, October 7, 2018. Check in at Apricot Yarn on Sunday, October 7 to get started! Hangout at Apricot Yarn on Sunday, October 28 to show off your hats! We are all equal. It's that simple. So this is a simple hat with stripes. I sized it from baby to adult so you can make one for anyone and everyone you love. This is a political movement and while you may or may not support it this is a cute hat that you can make in pink or any other color. It's up to you! A simple, quick, basic beanie is my favorite thing to knit. That's the Baa Baa Beanie! Choose your favorite color of Baa Baa Bulky yarn and cast on. Just one ball makes a hat sized for anyone in the family!